Understanding and consulting communities before initiatives is key to raising awareness and engaging them in long-term solutions to rabies control. A collaborative team from the Global Alliance for Rabies Control, Glasgow University and Ifakara Health Institute in Tanzania was asked to deliver rabies prevention messages to children in a group of rural Tanzanian villages. They hoped to reach some of the young people in schools, but previous research had identified that many young people were not at school. How could this latter group best be engaged? The researchers needed to find out more about the community, and the people in it who could reach the young people and influence them in the future. They also needed to find a way to measure whether anything had changed as a result of the initiative. They therefore designed a multi-stage pre-intervention study to consult the community through interactive workshops, household surveys and knowledge, attitudes and practice surveys. An initial stakeholder analysis identified potential collaborators in the villages and prioritised them in terms of their sustained influence on the young people the researchers wanted to reach. These people were invited to meetings, but were first asked some questions about how they viewed dog bites and rabies. They were then given some basic information about rabies prevention, and took part in interactive activities to help find out how, when and where to reach the out-of-school young people, how best to word the messages for them and which media would be most feasible and effective. After the workshop, the participants were asked the same questions as they were asked at the beginning, to look at how their knowledge and attitude towards rabies had changed. This would be repeated a year later, to see how much things had changed in the village in terms of rabies prevention. At this point, the researchers were able to work with the community to design the intervention, and had engaged a cross-section of key people to help them take it forward. 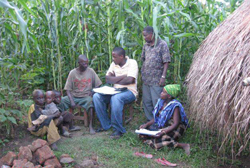 This consultation stage can take longer than the awareness events themselves, but it can be seen as an essential tool in making the messages more effective and sustainable, encouraging the community as a whole to take part ownership of rabies prevention, and ultimately linking community engagement to regional and national measures.